A police pursuit of a car which crashed leaving a female passenger seriously injured was "justified and proportionate", a report has said. The Police Investigations and Review Commissioner (PIRC) said the crash was caused by the male driver driving at excessive speed and losing control. 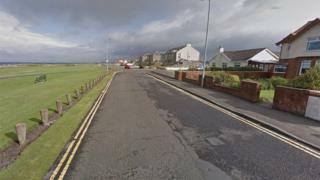 It said the driver failed to negotiate a bend at Beach Road in Troon at about 00:30 on 18 October and hit a wall. He was injured in the crash and the female passenger was seriously injured. The report found that the pursuit began when two police officers in a marked police car saw the man driving erratically. At first the car appeared to slow down but then it accelerated quickly away from the police car, the PIRC report said. The police officers pursued the car through the streets of the Ayrshire town for about two miles before the driver crashed into the boundary wall of a house. The man was arrested and charged with dangerous driving and other offences and was recently sentenced to 27 months in prison.